I am way to happy with such things as swatching! I am having so much fun figuring out combinations of yarns and patterns and beading and felting swatches that, well...seriously, a person shouldn't be having this much fun swatching. Ther is nothing like being in the creative zone...one idea after the next. I don't even know why its happening, but am happy it is. 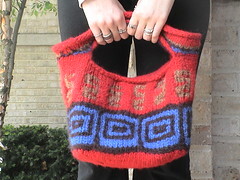 I posted a new pattern. Nothing earth shaking in terms of my slip stitch patterning love, but what I love about her is that you can create a nice sized bag in one piece, top down in a day, or weekend. She is kinda hot too!